Weddings are as popular as ever with thousands taking place every year. While some couples want a traditional church or registry office wedding, there's an increasing trend to marry in whacky and exotic places. Here are some ideas of how to join those who dare to be different in celebrating their love. Beach weddings are increasingly popular in warm, exotic places. Many luxury hotels around the world offer wedding packages with someone to conduct the service and a romantic backdrop of waves, sun and sand for the wedding photos. Disadvantages include the price, the cost of getting your friends and family there with you, and possible complications with the foreign paperwork. This is great for couples with families in different places. Why not get married in one place (e.g. London) then travel to another location for your reception? Choose somewhere you've a connection with, either because you love the place as a couple or because family and friends are there. Paris is a top romantic location, hand-in-hand with another capital city, but it could be virtually anywhere. Disadvantages of this romantic idea include the cost of moving locations and the possible inconvenience of travelling on your wedding day, although you could continue to celebrate as you journey with a bit of planning. Nearly all the major cruise lines offer on-board wedding packages. The ships have dedicated wedding rooms and someone to legally marry you. You can opt for all the usual trimmings such as flowers and champagne and can even have all your guests sail with you as you marry on the high seas. The main disadvantages are the cost and the risk of bad weather at sea on the day. The main benefits are that you can sail virtually anywhere and enjoy your honeymoon within your package. At the other extreme, you could choose to be surrounded by desert and marry literally in the middle of nowhere under a tepee. The wow factor in this kind of venue is the sheer open space, stunning vistas and possibly a few desert animals dropping in as guests. The desert's a romantic place with fabulous sunsets but the extremes of temperatures can require you to acclimatise first before your ceremony. Getting there could also be somewhat challenging and you may not have too many guests wanting to join you. Couples can literally marry anywhere these days and, with the news story in 2014 about a couple who married on a tightrope, anything's possible. Hot air balloon ceremonies allow you and a very few select guests to marry high in the sky with tremendous views, although bad weather on the day can make the flight impossible and not everyone is suited to great heights, including your registrar! what do I need to take on a spa break? If you need to unwind there is no better way to relax than with a relaxing spa break Wales at Bryn Meadows hotel and Spa. A winter wedding can be a magical day for all involved. With the crisp air and snowy backdrop, a wedding in the colder months can be a much more unique and memorable experience. 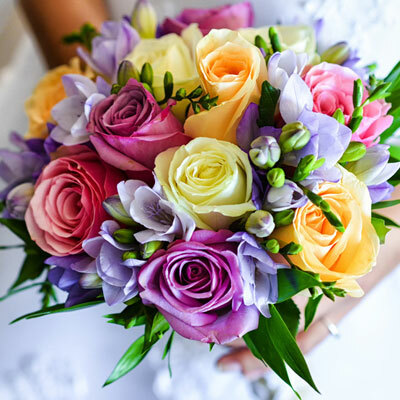 After choosing your dress and outfits for the bride and groom, best man and bridesmaids, the next thing to check off your to-do list is the wedding flowers. Weddings are as popular as ever with thousands taking place every year. While some couples want a traditional church or registry office wedding, there's an increasing trend to marry in whacky and exotic places.